That’s what I saw at the high school auditorium Tuesday night. Community, uniting in opposition to a corporation that threatens the fabric of the town they live in. A core group of people, in the form of Protect Sudbury, stepping up, already organized with officers, a board, and working groups, holding an open meeting to make sure their fellow citizens know what mega-utility Eversource has planned right through the heart of Sudbury. Every one of the five hundred or so people in the auditorium is a representative of our community, forming the core of a fast growing grass-roots movement to stop Eversource in its tracks. And how we need to grow that movement. Every single citizen will be affected by this project. The proposed 4.3 miles of 115kv transmission lines would run through the heart of Sudbury, from behind Buddy Dog, along south of Route 20, down Station Road, crossing Union, Horsepond, Peakham, and Dutton roads. So as you pick up your books from Goodnow Library and head for some Dunkin’, those towers will be there. When running for takeout from Franco’s or Lotus Blossom, taking a cooking class at Duck Soup, or heading to Cross Fit, The Performing Arts Connection, Little Hands Academy, Mass Gymnastics, Georgio’s Tae Kwondo, or the Field House, you’ll see them. Need to nip down to Sudbury Farms? You’ll get to cross right under them as you head down Union Ave. They’ll be in people’s backyards, while their kids are on their swing sets, or families are outside grilling, visible from thousands of homes, along our streams and wetlands, and in our conservation land. 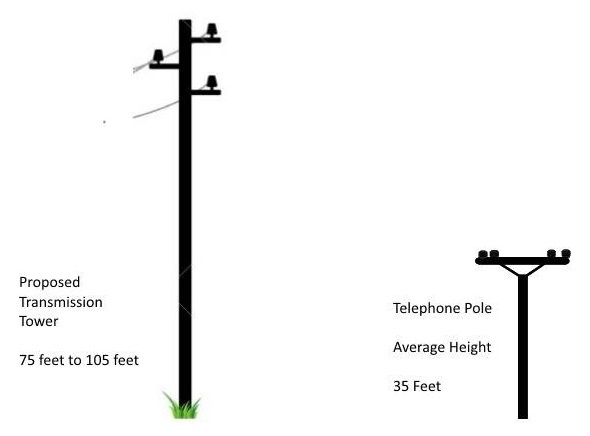 They’re more than twice the height of regular utility poles, won’t be intermingled with the trees that line our streets. Instead, it’s an an eighty two foot clearcut the size of the Mass Pike with a cocktail of herbicide for vegetation control, not just at installation, but repeatedly, as part of the ongoing maintenance routine. It’s such a crazy idea, it’s hard to imagine how Eversource even has the chutzpah to propose it. Here’s how: utilities and old railway rights of way operate in a different regulatory world, so the normal rules of common sense, preservation, and conservation don’t apply. Eversource is a huge corporation with the muscle and deep pockets to be ballsy enough to propose big projects that decimate everything in their wake, but somehow present them as beneficial to the community. Don’t be fooled by Eversource corporate speak about stakeholders and community engagement. It doesn’t care about all the reasons you moved to Sudbury. It doesn’t care about about the preservation ethic of our town, our agricultural heritage, or the extraordinary natural beauty of 800 acres of trails on town owned conservation lands. Eversource doesn’t care about the historical sites, hiking, fishing, sledding, photography, and bird watching that residents enjoy. It doesn’t care about those of us who have lived here for years, or even generations, or new residents who chose to come here, sit through Town Meeting every year to approve funds to preserve the natural beauty and open space in our town. It doesn’t even care about our stellar property market or great schools, which when all is said and done, will end up being affected by this project as it changes the fundamental character of our town. Don’t be fooled by talks of reliability, preferred routes, and alternative routes. Don’t be fooled by powerpoint presentations talking about grid deficiencies and growing customer demand. Eversource is offering, literally, the path of least resistance for this transmission line, and not coincidentally, the most profitable option for a project of questionable benefit in the first place. Eversource doesn’t care because it doesn’t have a conscience; it has a bottom line. The things that are close to our hearts – the historic character, the natural beauty, the views, our back yards, our health, our wetlands, our conservation land, our neighborhoods – are merely things to be mitigated. It’s all been done before and Eversource has the money to do it again unless we campaign, fight, organize, agitate, complain, litigate, and throw everything we have at them. It won’t be quick. It will be dirty. We will have to dig deep, deep into ourselves as individuals, and as a community, to keep the momentum of the fight and deep into our pockets to fund the legal battle that will ensue. Thank goodness for community. We’re going to need it in spades. Become part of the growing grass-roots movement to preserve Sudbury and stop Eversource. Connect with us: Check out our website and our Facebook page. Repost Facebook stories on your own timeline and invite your Sudbury Facebook friends to join the group. If you Tweet, follow @protectsudbury. We’ll follow you back! Come to meetings: Come as much as you can so Eversource understands that we have no intention of just fading away. Meetings will be posted on Facebook and the website and you can always consult the Protect Sudbury Calendar. Volunteer: Give your time and talent: Spread the word about Eversource’s plans. You’re busy. We get it. We’re all volunteers with other commitments, jobs, and families. Do what you can. Most importantly, inform and educate your neighbors, enlist help in spreading the word, and encourage donations to the legal fund. Contact streetcaptains@protectsudbury.org for more specific information. Spread the word with email: Email your book group, your poker pals, your wine tasting buddies, your mom’s group, whatever. Direct them to our Facebook page and our website. Remind them about meetings. Put up a yard sign Order a sign through the website, or order a whole bunch and offer them to friends and neighbors. And please, if you can, DONATE to the legal fund. Protect Sudbury (not the town) has retained Burns & Levinson to represent our legal interests. Fantastic work pulling together this group so quickly. Thanks. You can count on us to help with this fight.